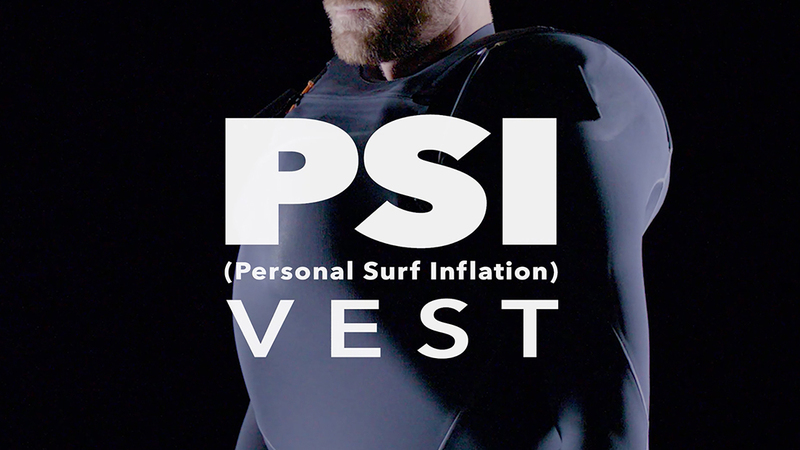 Collaborating with many of the world’s best big wave surfers, we developed the PSI (Personal Surf Inflation) Vest to help increase safety in heavy surf. The vest supports multiple rapid inflations and features a dump valve for quick deflation in the water. We received a U.S. patent for its innovative technology in 2014. 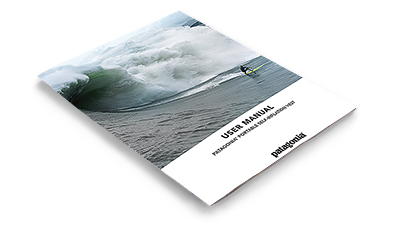 The User Manual below contains essential information about its features, operation and care. For any questions, contact inflation.vest@patagonia.com. INJURY OR DEATH, INCLUDING DROWNING, COULD OCCUR WHILE WEARING THIS VEST. WARNING: THIS IS NOT A LIFE JACKET OR LIFE VEST.THIS VEST HAS NOT BEEN APPROVED BY THE U.S. COAST GUARD, TRANSPORT CANADA, OR ANY OTHER AGENCY MAKING OFFICIAL APPROVALS OF FLOTATION DEVICES. NO EXPRESS OR IMPLIED WARRANTIES ARE MADE CONCERNING THE USE, PERFORMANCE, OR MERCHANTABILITY OF THIS PRODUCT. THIS VEST IS NOT INTENDED TO BE WORN WHILE BOATING. THIS VEST IS INTENDED FOR USE ONLY BY SURFERS WHO HAVE BEEN TRAINED AND CERTIFIED BY THE BIG WAVE RISK ASSESSMENT GROUP (BWRAG). THIS VEST SHOULD BE USED ONLY IN AN ENVIRONMENT WHERE SAFETY FACTORS SUCH AS PATROL BOATS, RESCUE TEAMS AND SPOTTERS ARE PRESENT, AND WHERE THE SURFER IS UNDER CONSTANT OBSERVATION. DO NOT USE THIS VEST IF YOU HAVE NOT RECEIVED PATAGONIA-APPROVED INSTRUCTION IN ITS USE AND CARE. THIS VEST CANNOT BE CONSIDERED A SAFETY VEST OR LIFE PRESERVER AND IS NOT INTENDED FOR USE BY BOATERS OR PASSENGERS ON ANY WATERCRAFT. THIS VEST SHOULD NOT BE USED BY ANY PERSON UNDER 18, ANY PERSON WHO IS NOT A STRONG SWIMMER AND EXPERIENCED SURFER, OR BY ANY PERSON OTHER THAN THE PERSON WHO ORIGINALLY PURCHASED OR OTHERWISE RECEIVED THE VEST DIRECTLY FROM PATAGONIA. IT MUST BE WORN UNDER A WETSUIT THAT HAS BEEN SPECIALLY MODIFIED BY PATAGONIA TO ALLOW THE VEST TO OPERATE PROPERLY. BEFORE EACH USE, THE USER MUST INSPECT THE VEST TO ENSURE THAT IT IS 100% FUNCTIONAL AND THAT ALL MODES OF OPERATION ARE IN PERFECT WORKING ORDER, AS DESCRIBED IN THE USER MANUAL. BETWEEN USES, THE VEST MUST BE MAINTAINED IN ACCORDANCE WITH THE USER MANUAL. A HARD COPY OF THE USER MANUAL WAS INCLUDED WITH THE VEST. SURFING IS AN INHERENTLY HAZARDOUS ACTIVITY. THE PATAGONIA PSI VEST, WHEN USED AND MAINTAINED ACCORDING TO INSTRUCTIONS, CAN REDUCE, BUT CANNOT AND DOES NOT ELIMINATE, THE RISKS OF SURFING. NO EXPRESS OR IMPLIED WARRANTIES ARE MADE CONCERNING THE USE, PERFORMANCE, OR MERCHANTABILITY OF THIS PRODUCT. PATAGONIA, INC. AND ITS PARENT AND AFFILIATES SHALL NOT UNDER ANY CIRCUMSTANCES BE LIABLE FOR ANY DEATH, INJURY, LOSS OF PROPERTY, LOSS OF USE, OR ANY OTHER DIRECT, INDIRECT, OR CONSEQUENTIAL DAMAGES SUSTAINED BY USER IN THE COURSE OF USING THIS VEST. USER’S SOLE AND EXCLUSIVE REMEDY IN THE EVENT OF DISSATISFACTION WITH THIS PRODUCT DUE TO DEFECT NOT CAUSED BY USER SHALL BE TO RETURN THE VEST TO PATAGONIA FOR A REFUND OF THE PRICE PAID. ALL OTHER WARRANTIES, EXPRESS OR IMPLIED, AND ALL OTHER REMEDIES WITH REGARD TO THE CONDITION AND/OR USE OF THE PRODUCT, WHICH MIGHT OTHERWISE BE PROVIDED BY LAW IN ANY JURISDICTION, ARE HEREBY SPECIFICALLY EXCLUDED. BEFORE EACH USE, USER MUST INFLATE THE BLADDER WITH AT LEAST TWO (2) 25g CO2 CANISTERS WITHOUT RELEASING ANY CO2 THROUGH THE DUMP VALVE TO CONFIRM FULL INFLATION OF THE BLADDER. LET THE INFLATED BLADDER REST FOR AT LEAST TWELVE (12) HOURS. IF THE BLADDER SHOWS ANY SIGN OF SOFTENING OR DEFLATION AFTER 12 HOURS, DO NOT USE THE VEST. INSTEAD, RETURN IT TO PATAGONIA FOR INSPECTION. THE BLADDER IN THIS VEST HAS AN EXPECTED USEFUL LIFE OF APPROXIMATELY TWO YEARS. BEFORE USING THE VEST ON OR AFTER THE TWO-YEAR ANNIVERSARY OF YOUR PURCHASE, RETURN IT TO PATAGONIA FOR INSPECTION AND POSSIBLE REPAIR OR REPLACEMENT. DO NOT USE THE VEST ON OR AFTER THAT DATE UNLESS PATAGONIA HAS INSPECTED IT AND RETURNED IT TO YOU. 2. tabs on the front lobes of the Inflation Bladder (see illustration #1). 4. tabs of the Inflation Bladder (see illustration #2). 5. Ensure the nuts on the four Manual Inflators are tight; use a 9⁄16" wrench to tighten the nut, if necessary (see illustration #3). 6. Ensure the Dump Valve is screwed on hand-tight (see illustration #4). 7. Inspect the threads of the four Manual Inflators for corrosion and damage. 8. Ensure the Trigger Cords run freely and are not twisted or restricted from moving. 9. The Trigger Arms must be in the Down Position before loading the CO2 Canisters (see illustration #7). 10. Screw in four new 25g-fill CO2 Canisters hand-tight. Ensure your wetsuit has the Pull Handle Snaps and Dump Handle Exit Hole installed. 1. Load four new 25g-fill CO2 Canisters. 2. Find a quiet place, and with the vest in your hands, trigger one of the CO2 Canisters. Listen and look for any leaks in the bladder. Return to Patagonia for inspection if any leaks or malfunctions are observed. If the bladder is leak free, deflate the bladder using the Dump Valve Cord and release all of the CO2. 3. Repeat step 2, and trigger a second CO2 canister to inflate the bladder. Listen for leaks once again and deflate the bladder if everything is functioning properly. 4. Repeat step 2, and trigger a third CO2 Canister to inflate the bladder. Listen for leaks once again. DO NOT DEFLATE THE BLADDER. 5. Trigger the fourth CO2 canister. The Dump Valve should automatically release the excess CO2 from the bladder when two canisters are triggered consecutively. When the Dump Valve has released enough CO2, the Dump Valve should stop releasing CO2. Listen for leaks after the Dump Valve stops releasing CO2. 6. LET THE INFLATED BLADDER REST FOR AT LEAST TWELVE (12) HOURS. 7. After 12 hours or more, check to see if the bladder has lost any of its CO2. If the bladder has softened or ANY CO2 has been lost DO NOT use the vest. Instead, return the vest to Patagonia for inspection. 8. If no leakage is detected, deflate the bladder and ensure all cords are still routed properly through the bladder (no twists) and that all cord knots are tight. 9. Complete all steps in the SETUP section and the PRE-SURF CHECKLIST. There are two Pull Handles on the vest to inflate the CO2 Canisters—one on the left chest and the other on the right chest. Each Pull Handle is designed to trigger two CO2 Canisters. For each Pull Handle, pulling DOWN triggers the first CO2 Canister, then pulling UP triggers the second CO2 Canister. NOTE: If you pull UP on the Pull Handle for the first inflation, both CO2 Canisters on that side will trigger. NEVER USE THE VEST WITH ONLY ONE FULL CO2 CANISTER REMAINING. 1. 1ST INFLATION: Pull the Pull Handle on the front left or right chest free of the snap on your wetsuit, and pull DOWN with a sharp tug to pierce the CO2 Canister. Release tension on the pull handle once the bladder starts to inflate. 2. 2ND INFLATION: Pull the same Pull Handle UP with a sharp tug to pierce the second CO2 Canister. Release tension on the Pull Handle once the bladder starts to inflate. 3. 3RD INFLATION: Using the opposite Pull Handle from the previous two pulls, pull the handle free of the snap on your wetsuit, and pull DOWN with a sharp tug to pierce the CO2 Canister. Release tension on the Pull Handle once the bladder starts to inflate. 4. AFTER 3 INFLATIONS, RETURN TO A SAFE LOCATION AND REPLACE ALL SPENT CO2 CANISTERS. NEVER USE THE VEST WITH ONLY ONE FULL CO2 CANISTER. 5. To deflate between inflations, pull the Dump Valve Handle located on the back left shoulder to release CO2. 6. REMINDER: If your first pull on the Pull Handle is UP, that will trigger both CO2 canisters on that side. NEVER USE THE VEST WITH ONLY ONE FULL CO2 CANISTER. 1. Remove all CO2 Canisters. 2. Rinse the entire vest with fresh water. 3. Rinse the bladder exterior and all four (4) Manual Inflators, including the threads, with fresh water. 4. Rinse the inside of the bladder with fresh water. Open the Dump Valve by pulling the Dump Valve Cord. Add fresh water through the Dump Valve. Move water throughout inside of bladder, then drain water by pulling the Dump Valve Cord. 5. Rinse the Dump Valve components with fresh water. 6. After the vest is thoroughly rinsed, allow it to air-dry in a cool, shaded place. Do not use heat to dry the vest. 7. Store your dry vest in a cool, dry place. 1. THE BLADDER IN THIS VEST HAS AN EXPECTED USEFUL LIFE OF APPROXIMATELY TWO YEARS. BEFORE USING THE VEST ON OR AFTER THE TWO YEAR ANNIVERSARY OF YOUR PURCHASE, RETURN IT TO PATAGONIA FOR INSPECTION AND POSSIBLE REPAIR OR REPLACEMENT. DO NOT USE THE VEST ON OR AFTER THAT DATE UNLESS PATAGONIA HAS INSPECTED IT AND RETURNED IT TO YOU. 2. User should not perform any maintenance on this vest. Return to Patagonia for any maintenance. 3. No person other than the original purchaser of this product should use it.